I recently learned that Japan boasts 45 of the world’s 50 busiest train stations, including the first 23 (source: rocketnews24.com) . The top three are all located in western Tokyo, a few stops apart on the Yamanote circle line. The busiest sits in the middle and sees almost 4 million visitors per day. Welcome to Shinjuku Station. The west side of Shinjuku Station. Photo by RS1421. If this is your first time here, you will get lost. If it’s your tenth time and your name is Indiana Jones, you’ll still get lost. This place is a sprawling maze of corridors, stairways, escalators and platforms and they all look nearly identical. As if that weren’t enough, restaurants and shops line the hallways and fill the air with the aroma of baking bread and steaming bowls of ramen. With so many distractions, you have no chance. Within minutes, you will have no idea in which direction you’re heading, in which direction you want to head and whether you are currently heading in the same direction as you were five minutes ago. You’ll be positive you’ve passed a certain spot several times before, but you’ll be wrong. Instead, you’ll have passed several other spots several times before, but you’ll have no idea you did so. I can read maps and have a decent direction sense, so I rarely get completely turned around like that. In fact, it has only happened twice: once when I ventured away from the touristy part of Marrakech in Morocco and the other on my third visit to Shinjuku station in Tokyo. Tokyo’s public transportation system as a whole is extensive. It is so extensive that you won’t generally find maps that depict all of it at once. Most maps will show either the subway system or the train lines. The subway maps look like a four-year-old has spent an hour working over a piece of paper with one of those giant 64-color crayon boxes. The train maps look like that kid’s little brother scribbled all over his subway drawing with a pencil, until absolutely no white space remains. While you will find some pretty good maps that show all of Tokyo’s train lines, you won’t find any that manage to accurately depict the extensive and convoluted Shinjuku Station. I’ve seen one that tried but it didn’t come close. Instead, you get different maps for different sections and you have to find the common stairway or hallway that connects one to the other. These maps might not do much to help you find your way, but they do convey the complexity of the station far better than any words. The first two times I passed through Shinjuku, I made it out with minimal difficulty. The first time, I arrived on the circle line and just needed to find the main exit on the west side. I made a few wrong turns, but got out fairly quickly. A few hours later, I did the same in reverse and had no problems whatsoever. My third visit was not so smooth. Once again, I arrived on the circle line, but this time I had to change to the Oedo subway line. This is one of Tokyo’s newer lines and one of the world’s deepest. One single set of escalators connects the Oedo line Shinjuku station to the rest of the complex and they have been masterfully hidden. If I’m not mistaken, this long-lost, mythical station is actually going to be the object of Indiana Jones’ next quest, should Harrison Ford live long enough to film it. The deeply buried Shinjuku station on the Toei Oedo line (purple) and, two floors above, the one for the Toei Shinuku line (green). The Yamanote circle line trains arrive at the Japan Railway (JR) platforms. These run north to south and divide Shinjuku and its station in half. Leaving the JR portion of the station, you have to choose either the west exit or the east exit. Once you’ve made your choice and passed through the ticket gates, you can’t go back without buying another ticket. There are two underground tunnels connecting the two halves of the station, but locating the entrances to those tunnels is more difficult than the Oedo escalators and beyond even Indiana’s capabilities. That said, I found one of those tunnels fairly easily. Unfortunately, I had actually exited the ticket gates on the same side as the escalator to the Oedo line station and had no need for the tunnel. Despite that, I not only located it, I passed all the way through to the other side of Shinjuku and I did all this without realizing any of it. Then I searched for the Oedo escalators for a good 30 minutes before realizing I was on the wrong side of the JR tracks. At this point I still had no idea that I had actually started on the correct side, but I figured that out once I passed back through the tunnel and noticed how familiar everything looked. Of course that didn’t happen for a while, since the tunnel had suddenly become much harder to locate, now that I was actually looking for it. The new Keio line station and that’s it…that’s pretty much all of Shinjuku station. I did find it eventually and crossed back under the JR tracks to the correct side. I spent the next hour or so piecing together vague clues written in strange symbols on countless incredibly detailed and complex maps. Just under three hours after beginning my quest, I did it! I finally reached my destination! Elated and exhausted, I plopped myself into an empty seat on the train and began to wonder if I would be able to retrace my steps (not all of them, mind you; only the ones that actually took me closer to my destination, which was a shockingly small percentage of the total steps I took that day) and find the Oedo line escalator again. I would would get plenty of opportunities to find out, since I was on the way to my new apartment in Shinjuku ward, just three stops from Shinjuku Station. Over the next year, I passed through that gigantic maze hundreds of times and got to know it quite well. I soon realized that things could have been much worse that first day. It could have been rush hour. Crowd of people waiting for the green Yamanote circle line at Shinjuku Station. Photo from Wikimedia Commons. Twice a day, the main corridors of Shinjuku station turn into a river of bodies. If you enter that river, the current immediately grabs hold of you and sweeps you away. It doesn’t matter where you want to go, you are now going where everyone else is going and chances are, most of them don’t really want to be going there either. Fighting against the current is pointless. You’re better off just letting it carry you until it dissipates then entering the current flowing in the opposite direction. You might feel the urge to panic, but there’s no need. Just look around and see how calm the Japanese people drift along. They barely even seem to notice. After seeing countless Japanese businessmen fast asleep while dangling from a hand ring on a crowded subway, I wouldn’t be at all surprised to see some of them taking a quick power nap in the river of people as it carried them toward the station exit. They would probably find that exit before any of us too, even while fast asleep. Despite the complexity and the chaos—or perhaps because of it—I absolutely love Shinjuku Station. It has everything you could ever need and a whole lot of things you don’t. You’ll find hundreds of restaurants, several electronic stores, one of the world’s largest bookstores, a couple of giant department stores and you’ll share it all with a population the size of Los Angeles passing through every single day. No trip to Tokyo is complete without at least one visit to Shinjuku’s massive station; just make sure you come prepared. I recommend a sleeping bag, basic survival gear, a three-day supply of emergency rations and a GPS locator so the search parties can find you. And it couldn’t hurt to bring along a ditzy blonde, an annoying Chinese kid sidekick and a whip. Just turned me off Tokyo for good. Aaaargh! Look at it all – and I thought London was bad. I was definitely never bored in Tokyo. And I kind of loved the complexity of Shinjuku Station. I found it was often best to just ignore them completely and follow my nose to some freshly baked pastries or a bowl of ramen. Yeah Shinjuku is crazy. Looking at all those maps in this post made me dizzy. Props to you for figuring out what line goes where and how to get there. Exiting Shinjuku station at night is like being on drugs. Lights coming at you from everywhere, people all around you liek a girl, cross dressers and transgenders and host boys and all night drinkin. It’s the place to be. I really think if you master the Tokyo railways/metro, it is quite a feat; like, something you could put on your resume. Anyway, made me so nostalgic for Tokyo. Ah, such a fun place. ‘What line goes where’ was easy; ‘where to find that line’ not so much. Shinjuku is definitely busy at night, at least the east side, although I really liked the little alley with all the yakitori places on the west side. I like your idea of adding the ability to read a railway map to my resume. I need something on there. At least until the half-page resume format catches on. I guess you’re one of the lucky ones–most people get lost their first few times at the station. I suppose it also depends on which train line you’re looking for. I doubt anyone would have trouble finding the JR lines, but some of the deeply buried subway lines require a full-blown expedition. I don’t know. I used to go through Shinjuku several times a week and never found it hard to navigate. The only notable thing I can think of about Shinjuku is the western toilets being used as a campsite. Empty food containers and sake jars. I found that odd, since Japanese are terrified of germs. Some homeless blokes or Chinese perhaps…. It’s hard not to get a sense of it being convoluted, but in an enjoyable/crazy kind of way as you suggest. Thanks! I was just back in Japan a year ago and went through Shinjuku Station a bunch of times. It was much simpler this time around, after having liked in Shinjuku for a year. Thanks for the article! A year ago I took the Narita Express to this station and was congratulating myself for the flawless execution of my plan when I stepped off the train. Ah, there ensued half an hour of frantic search for a way to get DOWN the elevated platform to a taxi stand. I never did find the escalator (yes, I know there is a very long one but it did not materialize and there were no helpful signs that I saw) nor a lift, so eventually I ended up hauling my bags down a long flight of steps. If I go back, I would probably be lost again. But the circle line – what a blessing! I loved the Yamanote (circle line), too. Unlike the subway, you actually get great views of the city. 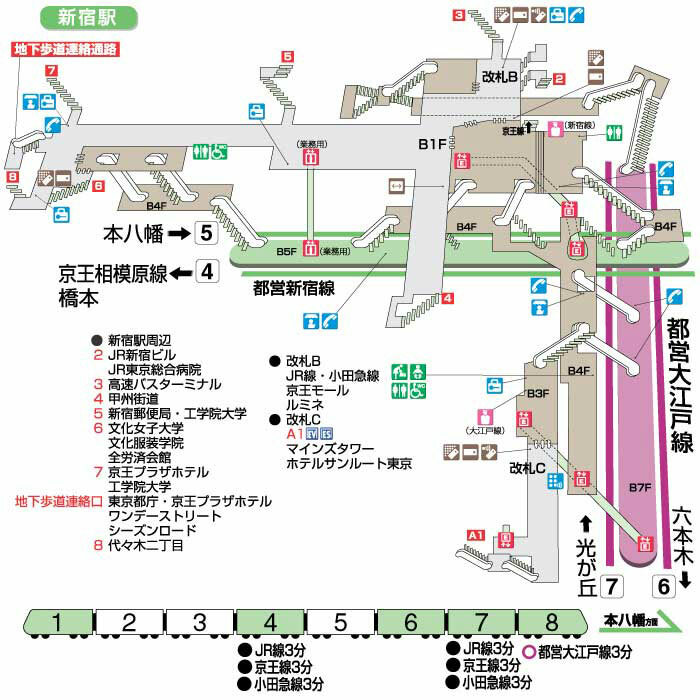 Ikebukuro is definitely much easier to navigate, since it’s basically a long hallway, but which station you use really depends on where you’re coming from or heading to. More lines run through Shinjuku than anywhere else. The exit nearest the restaurant would be great, but I’d just shoot for any exit on the east side and then find the place above ground. Of course, if you’re going to scout out the route beforehand, you’ll have plenty of time to find the exact exit you want. Good luck! I never went to that robot restaurant when I lived in Tokyo. I didn’t even know it existed (if it existed at the time), but I feel like I’m constantly seeing it on travel documentaries recently. It looks insane. I’m not sure how long I would last in there, before having to escape the sensory overload….even Tokyo’s electronic stores were too much for me after 30 minutes or so. I think Robot Restaurant is a new thing, within the last year or so? How long ago did you leave Tokyo? I saw it first on Anthony Bourdain’s show and like you I thought it was totally insane! But I had somehow forgotten all about it until I saw it on japanican while booking my hotels and figured, why not? Definitely not something you can do anywhere else haha. Not sure either if I can withstand a whole 90 minutes of it but it’ll definitely be the craziest thing we will do in our two weeks in Japan. As an aside, this restaurant is in Kabukicho which I found out is a red-light district.. I’m sure it’s fine and not as bad as some people make it out to be, but I have wondered if I should be guarded walking there at night. I also saw it Bourdain’s show! And a few others, but I can’t remember which ones. Kabukicho is a red light district, but it’s perfectly safe, at least in the parts near the station. It’s basically a tourist attraction these days. It does get seedier the further north you go (toward Shin Okubo), but I’m guessing the robot restaurant is near the station. You’ll be able to tell when you start getting into the sketchy parts, because the crowds will suddenly disappear and you’ll start seeing more gangster types. I really liked Shinjuku park and it’s also on the east side of the station, so that might be a good place to hang out before showtime. Or the bars in Golden Gai, which I’ve also been seeing on tons of travel shows, including Bourdain’s. hi, you mentioned “Twice a day, the main corridors of Shinjuku station turn into a river of bodies” – around what times of the day? only weekday? thanks! I’m not sure, to be honest. The worst time is during morning rush hour, but I don’t know when exactly the peak time is (sometime between 7 and 9) I was just in Tokyo for a few months, but I made i a point to avoid the crowded times. Thanks so much! After very long and tedious search for the station layout for Oedo Shinjuku Station I finally found here! You’re welcome, I’m glad it helped! In Japan, there are always a lot of maps of the stations in the actual stations, too. I always loved that.